Following an extensive, six-year refurbishment, L’Oscar opened last year, taking over the former Baptist Church Headquarters. Built in 1903, the Grade II-listed venue closed its doors to parishioners during the 1960s after its congregation dwindled. The building has since been returned to its former glory, however, re-opened as a boutique hotel last year, designed by French architect and interior designer Jacques Garcia, also behind the likes of Hôtel Costes in Paris and La Mamounia in Marrakesh. Set over seven floors, the lavish 39-room hotel has retained many of its original fittings, including ceiling friezes, stained glass and fireplaces, matched with Garcia’s flamboyant touch of magnificent maximalism evident throughout the space. Think butterflies, bird and peacock feathers, plush velvet and a baroque colour palette. 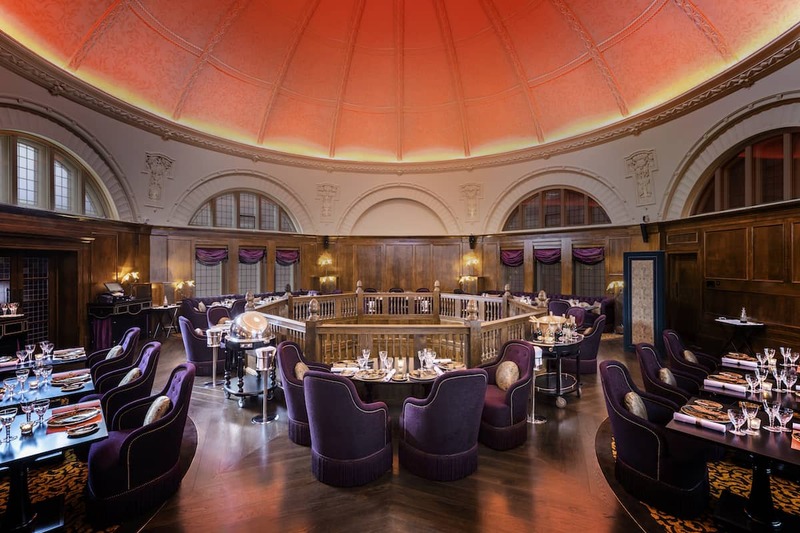 On the first floor, L’Oscar’s fine dining restaurant, The Baptist Grill, occupies a fittingly opulent space with an octagonal chapel as the centrepiece, with its hand-painted domed ceiling. With space for 45 covers, the dining room is extravagantly festooned with plum velvet chairs, Lalique bird lamps and an octagonal balcony peering down into the bar. In the kitchen, executive chef Tony Fleming (formerly of Angler) has been brought in to supervise a menu that taps into the recent revival in popularity of grill room restaurants. 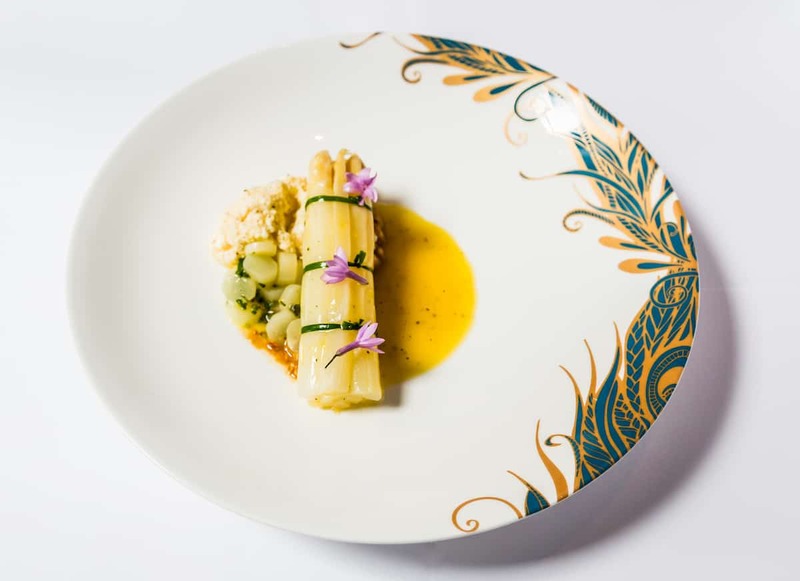 Here, classic British dishes are executed with pronounced refinement. Service is equally polished. A recent lunch began with a round of warm bread alongside a glossy blob of caramelised yeast butter rampant with a tangy sourness: the meal’s first hint of accentuated attention to detail. 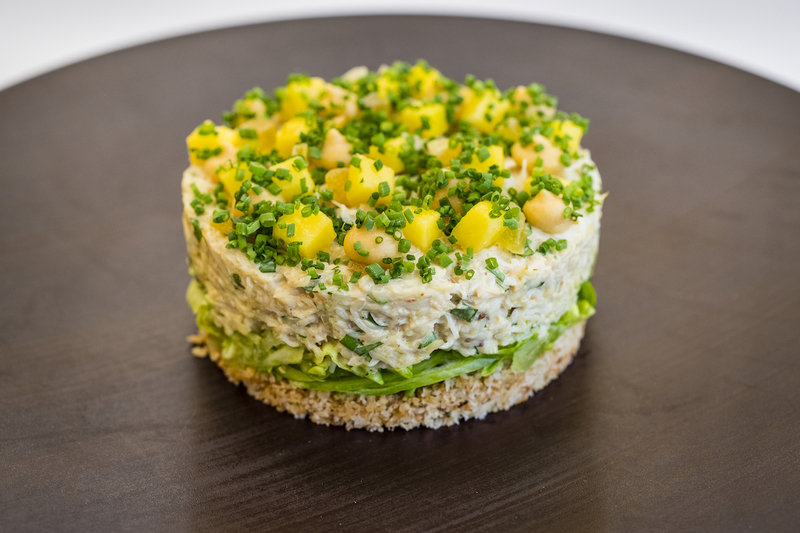 To follow, a Coronation crab salad (£18) was dressed up like a cheesecake, with a crumb base topped with delicate crab fronds, their natural sweetness complemented by some mango dice, a whisper of pickled lime and shredded lettuce to bring restraint. A glorious produce-focussed dish, tremendously executed yet ample for at least two. Also advocating seasonal produce, white asparagus spears were gently steamed, expertly matched with a rich pine nut praline, jasmine honey and fresh ricotta made onsite (£15). Naturally, a number of steaks were available from the grill section of the menu, including bavette (a refreshing alternative to prime cuts such as sirloin or fillet), rib-eye and Cote de Bouef for two to share. Elsewhere, traditional dishes such as best end of lamb or roast chicken were served alongside a handful of fish dishes. A thick tranche of cod (£26), for instance, was superlatively roasted, cloaked with a verdant, herbaceous crust and served over jersey royals with a generous smear of warm tartare sauce. Another grill room staple, Dover Sole was cooked with a similar degree of excellence, with the choice of being served off the bone, simply accompanied by a sauce of butter, capers, parsley, preserved lemon and some more butter. To finish, a mille feuille (£9) featured a stack of brittle pastry storeys detached by spheres of caramelised apple and vanilla custard. ‘Rhubarb and Custard’ (£9), on the other hand, showcased a modern play on a quintessential British classic. Here, a rocher of tart rhubarb sorbet was cossetted by a cloud of custard foam heavily showered with a torrent of crumbed ginger snap biscuits. A glorious example of the refined British cuisine so eloquently championed at The Baptist Grill. The Baptist Grill can be found at L’Oscar 2-6 Southampton Row, London, WC1B 4AA.